A galette is supposed to be rustic, and mine certainly looks that way! 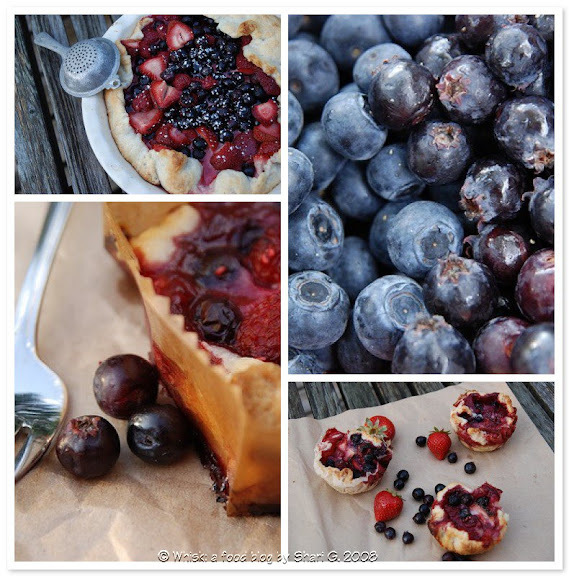 Baked in a brown bag, filled with a mixture of summer fruits including saskatoons, blueberries, strawberries, and raspberries, drizzled with pastry cream, and served with ice cream, this is a delicious and easy dessert. Galettes are usually round, flat, free-form tarts with a thin, crispy crust that’s been folded over onto the fruit. By its very nature, a galette is rustic and not meant to be perfect. It's a round of pie dough folded over the edges of a filling, and what makes it so charming are its pleats, bends and wrinkles. The pastry for this galette is one we’ve made before for the blueberry pie. I just pile all the ingredients on the counter and pull it together with as much ice water as needed. I’ve made it several times, and it’s flaky and tender and holds up every time. 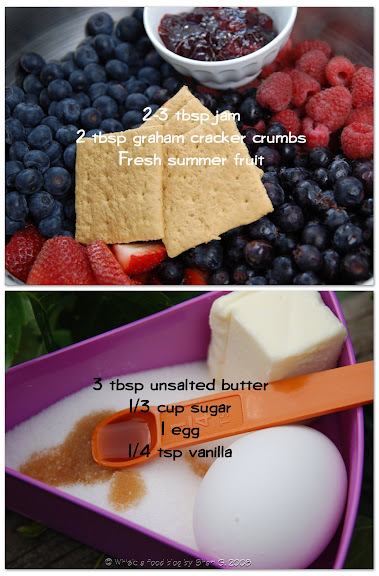 A sprinkle of ground graham crackers before adding the filling helps soak up the juices that ooze out of the fruit during cooking. It’s saskatoon season here in Saskatchewan. 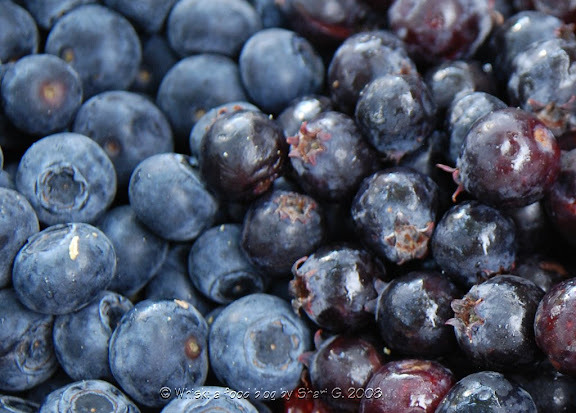 At the farmers’ market, pails are brimming with big, delicious berries. Although saskatoons look like blueberries, they taste very different. Saskatoons have a thicker skin and thicker juice. Saskatoons grow on deciduous shrubs and are common in the prairie provinces (Manitoba, Saskatchewan, and Alberta). They are classified as a pome, or apple, and not a berry and have a variety of names: service berry, may cherry, june berry, june bush, shad bush, shadblow, shad berry, shad blossom, shad wood, sugar pear, Indian pear, grape pear, lancewood, box wood. I only know of one farm in the Ottawa region that grows saskatoons, Ovens Berry Farm, so I feel lucky to be in the heart of the harvest here in Saskatchewan. I knew I couldn’t get away without tossing some handfuls into this summer fruit galette. Saskatchewan, the province, got its name from the Saskatchewan River, which the Cree called Kisiskatchewani Sipi, meaning “swift-flowing river” and Saskatoon, the city, got its name from the edible berry native to the area, which the Cree called mis-sask-guah-too-minute, meaning “wild berries”. Since I’m visiting Saskatchewan, I found some local cherry spread (not called jam since the Canadian Food Inspection Agency thought it didn’t have enough sugar in it to be labeled a jam). 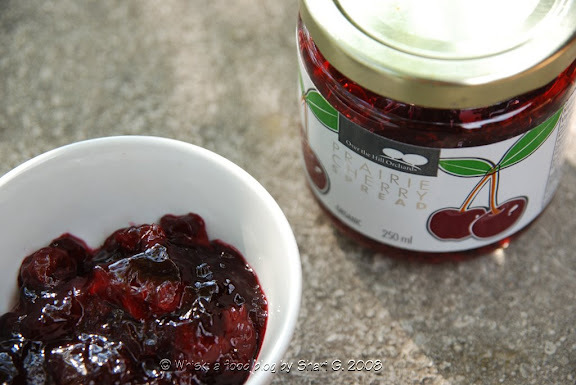 It’s made by Prairie Cherry, a local organic orchard who is bringing fruits to the harsh climates of the prairies. They’ve crossed the Mongolian cherry (Prunus fruticosa) with the Sour cherry (Prunus cerasus) to create a wonderful fruit that is perfect as the jam-base for this galette. I saw a picture in the latest Cooking Light magazine of a galette sitting on a paper bag, and I thought it would be a neat idea to try baking Dorie’s galette in a paper bag. The shape of the bag helped the galette hold its form, although in a rustic way. I should have made the sides of the pastry rectangle higher to hold the juice in better. I also tried making the galettes in a round coffee filter, but this paper was too flimsy to hold its shape so I plopped these inside a ramekin before baking. You can find the recipe for Summer Fruit Galette in the book Baking: From My Home to Yours by Dorie Greenspan. To see how the rest of the TWD group fared with this week's recipe, click here and then click on each blogger! Thanks to Michelle from Michelle in Colorado Springs who chose the recipe for this week. I love the versatility of this dessert since any bowl of fruit in season will work. The drizzle of pastry cream in this recipe took this galette up a notch. Once again, the pastry was crispy and flaky and one I’ll use for pie-baking in the future. 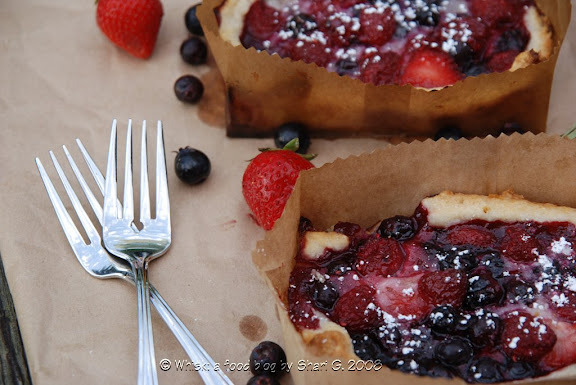 This bumbleberry galette filled with summer fruits is a perfect dessert. Black and White Banana Loaf on page 232 chosen by Ashlee of A Year in the Kitchen. Wow, they look great in the paper bag! I'll bet it tasted divine. I love the idea of the paper bag! Your galettes look wonderful! I like the brown-bag idea - maybe mine would have looked less rustic that way! Gorgeous! I never knew about saskatoons. Thanks for the education! Absolutely beautiful. I love the tidbits of history and information in your posts. I always look forward to your pictures. Lovely. you give the term brown baggin' it a whole new meaning;) your galettes look great! Your galettes look fantastic! Love the paper bag. What a cool post!! I had never heard of a Saskatoon. And the brown bags? Too amazing. You are some kind of alien genius, I think. Looks great. Can you describe the taste of the saskatoons? Do they taste like blueberries? Seriously, Shari, why are you not a professional baker AND food photographer AND food historian all in one? You never cease to amaze me! Your galettes looks fantastic and yummy! The jam sounds lovely. Beautiful, Shari! Just absolutely beautiful! It looks completely and totally delicious. Love your photos. And thanks for introducing me to a new fruit -- I've never heard of saskatoons down here in New Jersey. Oh my goodness, your pictures and food get prettier by the week. You're a real pro! Why aren't you making a food magazine? I'd buy it. My goodness, they look so neat! I bet it was fun to tear them out of the paper too. Great job on this recipe! Saskatoons...I just love even saying it...thanks for the little description, photo, and tidbits as I just love those each week. Astounding photos, as always...an the bag idea, very very nice. I just love the rustic look of those. Sounds like you are having a great time there...ask if I can come when you leave, okay? LOL. See you tomorrow...late, another busy day of cooking and pool foolery. Will post by 5:00 p.m. I love the pic of the galettes in the paper bag! Looks delicious! The paper bags are really nice. This was a fantastic dessert! i love the paper bag idea. tres tres bien! now your galette look super rustic! great job! Ahhhh Saskatoons. I just *luckily* found some here in Ontario as I wished my father in law well & off to Winnipeg... with a request to fly me home some more. We'll see. Your photos are absolutely lovely. The paper bag is such a great idea! shari this looks amazing !!! i am constantly amazed at your creativity! i had to skip out this week, and i am bummed because the more galettes i look at, the more i want to be eating it RIGHT NOW! wow, I have learned two things!! I have neaver heard of a saskatoon (they look fab!) and i had never seen a Graham cracker before!! Now I know that they are not so much like NZ wine biscuits which i have substituted in the past but are more like a digestive! thanks :0) your galettes look great too! How fun baking them in the brown bags! Always a pleasure to stop by your blog. Beautiful pictures. Your berry selection looks absolutely beautiful! Don't tell but I think yours is one of my favorite summer fruit galettes in this week's TWD. These recipes look lovely. Since I live in Ottawa, I'll be off to Ovens to get some saskatoons this weekend! Never had them, so I'm looking forward to it! Thanks! What a great idea. Did you have to soak the bags in water before baking them off or was there some other trick? Oooh, how fun! you always come up with so many creative ways to present your desserts. Nice work! I love the paper bag idea. Ingenious! They look delicious. Brown-bag rustic tarts, what a great idea! I love your combination of berries, too! I love the brown bag, it's perfect (in the rustic way!). Those look like amazing berries and I love your photos. Great job!